Let’s say Glocks are like Toyotas. They are good, dependable firearms with features you want, that hold their value and you can count on them to not let you down if you’ve cared for them properly. Using this same type of comparison, I’d say Smith & Wesson M&Ps are like Hondas, or Nissans. They’re equal in quality in every way to the Glocks, but maybe some folks like one brand better than the other. For some reason, I’ve never been that attracted to Glocks. I compared different guns on the market in the self-defense category and talked to a bunch of people and bought a Springfield. It’s like a Glock on steroids. It has all of the Glock features, it, too, is made in Eastern Europe, but it has an added feature Glocks don’t have–a grip safety, like on a 1911. In the process of becoming a firearms instructor I took a lot of classes. In these classes I took note of what other people were shooting. I was shooting my Springfield and getting along fine, but I noticed a lot of my classmates were shooting M&Ps. When I asked them what they liked about the M&P the most common comment was “lower felt recoil than most other guns of this size and caliber.” Interesting. I asked why that was and was told it was because of the grip angle and some dynamics about the barrel to slide fit. M&P, by the way, stands for Military & Police. My Springfield was a 45, so the first S&W M&P I remember buying was a .45. It carried 11 rounds–ten in the magazine and one in the chamber–and was thinner than the Springfield XDm by a small margin. It fit in the same holster, so carrying it was not a problem. This became my .45 carry gun. I carried it in a Crossbreed SuperTuck Inside the Waistband (IWB) holster. Some sale came along and I got a .40, which was promptly placed into the home defense mode, complete with a Streamlight light and laser combo. I’m not sure how this all happened, but before I knew it I had a plain Jane 9mm M&P and then a VTAC model that’s FDE coloring with a really cool Viking Tactical sight. The Viking Tactical Sights consist of a set of Trijicon night sights on the bottom with fiber optic sights above. So the sights are visible night or day and regardless of which set you use, target alignment is easy and sure. If you don’t like the two sets of sights that are inlaid, use them as if they’re a black notch and post. These sights present the best for whatever type of sights you prefer. I was learning about Apex trigger conversions about the time I got the VTAC M&P so I ordered a trigger set and installed it. This set cleans up any dragging or creeping in the trigger and makes for a nice crisp and clean break. The VTAC is a very nice defensive firearm. Once I had M&Ps in the three most popular defensive calibers, it was time to add a .22 for fun shooting and practicing. The S&W M&P .22 is the same size as it’s bigger brothers, but you can shoot it with no recoil. It’s a great gun to help introduce people to pistol shooting. 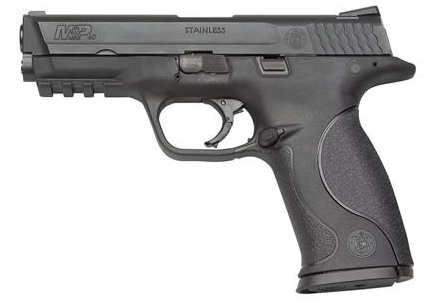 Smith & Wesson makes compact version of the 9mm, .40 S&W, and .45 ACP M&Ps. So it made sense for them to make a compact version of the .22 as well. The advertising slogan that came along with that little gun was, “22s are fun! Ours is funner!” It is a great plinking or target practice pistol. My wife, my granddaughters and I all really enjoy shooting the M&P .22 Compact. Sometime back I got an email announcing some Colorado Springs Police Department trade-ins that were like new. Funny story about those trade-ins. The Colorado Springs Police Department powers that be (probably the lawyers) discerned that it would be safer for their police officers to have handguns with a magazine disconnect safety so that if a bad guy tried to take their gun away from them they could drop the magazine and the bad guy wouldn’t be able to shoot the officer. But the police officers didn’t like that feature much. Smith & Wesson offered to trade the original guns out for ones without the magazine disconnect safety, using Bud’s Gun Shop in Kentucky as the go between. Bud’s wound up with all the trade-ins, which they offered at a very attractive price. I got one for the historical value – not that’s it’s much value, but the story is interesting. When I got the gun I found it had CSPD and a special number engraved on it in white. Sometime later, I came across a .40 caliber Atlanta Police Department trade-in. I sold the .40 I had and got one of the ones from Atlanta. It appears I’ve started a police department M&P trade-in collection. The Colorado Springs PD 9mm has become Joyce’s home defense firearm, the one she keeps by the bed and the Atlanta PD 40 caliber has become my by-the-bed home defense firearm. I carry the 9mm VTAC is sometimes when my arthritis is acting up and sometimes I carry it just for fun. It’s a really cool gun! Glock used to be king among police, but the Smith & Wesson M&P now has a hefty share of that market. Smith & Wesson did something to help the decision makers. When you disassemble a Glock for cleaning, part of the process involves pulling the trigger. Of course a gun is supposed to be unloaded when you get ready to clean it, but unfortunately there have been incidences when police officers have shot themselves in the leg when trying to disassemble their Glocks for cleaning. Smith and Wesson added a little lever that must be pushed down to allow the slide to come off and provided a tool to work that little lever so you can disassemble the M&P for cleaning without having to pull the trigger. Frankly, I find the little lever and tool just a little aggravating to use, so I make sure my M&Ps are unloaded and go ahead and pull the trigger when removing the slide and that works just as well. The M&P family incudes rifles and revolvers as well as the semi-automatics. The semi-automatic line includes the single-stack and very concealable Shields, which have been really big sellers at our gun store and at others across the country. Smith & Wesson, long an American icon in the gun business, has put together a line of firearms everyone of which is a real winner. I really like these guns. They’re not fancy. They are utility guns that will work when you need them to. As far as shooting them goes, I, too, find that the felt recoil is less than with other guns of the same basic size and caliber. 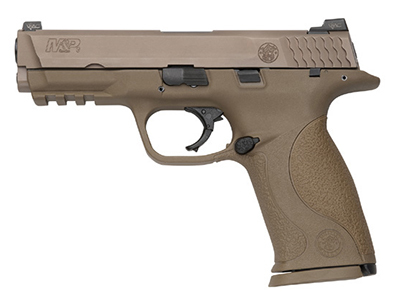 I never hesitate to recommend an M&P for anyone want a good, solid, basic handgun. And if you want something with more pizzazz, they have Pro and Competition models, too. Would you believe I now have a Vermont State Police M&P .40 and a “never issued” Detroit Police M&P .40. These police trade-ins all come with night sights and 3 magazines for well under $400. So I’m stashing them here and there as defensive guns. I load them with Ruger or Polycase ARX defensive ammo, which is a very powerful defensive round with reduced recoil because it shoots lighter than normal weight bullets.